Holbeach striker Jake Clitheroe (10) is sent off by referee Michael Dunkley during the win over Peterborough Northern Star. Photo: Tim Gates. Deeping Rangers and Wisbech Town are involved in FA Vase replays against Eastern Counties League sides tonight (September 13). Deeping host Walsham Le Willows, while Wisbech travel to Mildenhall. Both original ties in the first qualifying round finished 2-2 after extra time on Saturday (September 10). Peterborough Northern Star goalkeeper Dan George makes a great save during the game at Holbeach. Photo: Tim Gates. 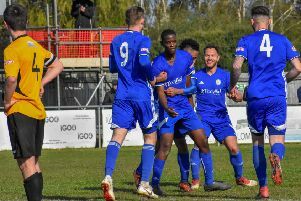 If Wisbech win they will cross swords with United Counties Premier Division leaders Peterborough Sports, for a third time this season, in the second qualifying round. Deeping are playing for the right to play another UCL top-flight side Boston Town. There’s Premier Division action tonight for Peterborough Northern Star who travel to Eynesbury Rovers. It’s a mid-table battle between two teams who suffered disappointing weekend defeats when Eynesbury were crushed 7-0 at Yaxley in the FA Vase and Star went down 2-0 at 10-man Holbeach. Unbeaten Holbeach host Huntingdon tomorrow (September 14) when Sports have a tricky game at Sleaford.